BDS Suspension operates with one guiding premise—to provide true value to the customer by engineering and manufacturing the highest quality aftermarket suspension lift kits, leveling kits and accessories for 4x4 off-road truck and Jeep enthusiasts. 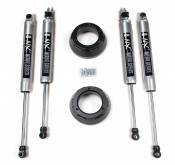 Their suspension products are priced competitively, and backed by the best lifetime warranty in the industry. Description: 2003-2008 Dodge Ram 2500/3500 w/ Y-Style Steering Note: mounting kit only. This system will work on stock height vehicles. 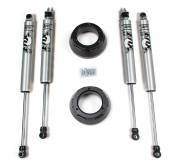 Description: 2005 - 2016 Ford F250/F350 4WD Note: mounting kit only - Shown with optional Fox 2.0 shocks sold separately. This dual system will not work on vehicles with less than 2" of Lift. Description: 2014 - 2017 Dodge / Ram 2500 Pickup 2013 - 2018 Dodge / Ram 3500 Pickup Note: mounting kit only. Shown with optional Fox 2.0 stabilizers. Description: 2017+ Ford F250/F350 4WD Note: mounting kit only - Shown with optional Fox 2.0 shocks sold separately. This dual system will not work on vehicles with less than 2" of Lift.